Hmmmm.....another outcome from man-made global warming? The survey also monitored what effect recent slips have had on the penguin populations. Initial observations had suggested that up to one fifth of the colony had been affected by these natural slips. 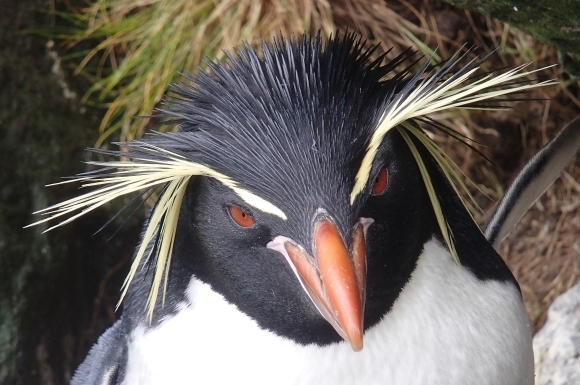 The survey results for the eastern rockhopper penguin showed that there was no change from the 2011 count. Major population changes of marine mega-fauna are ongoing as global warming, and other anthropogenic drivers affect prey availability. The historical stronghold of the Eastern Rockhopper Penguin (Eudyptes chrysocome filholi) was New Zealand’s sub-Antarctic Campbell Island, but the population declined by 94 % between 1942 and 1984. The apparent mechanism of collapse was warm ocean temperatures causing an inadequate food supply. Eudyptespenguin population declines are ongoing at some breeding sites, highlighting the need to investigate the population trend on Campbell Island since 1984. We estimated the Eastern Rockhopper Penguin breeding population size through physical and photo-counts of birds and nests in 2012, and changes in colony area relative to 1984 and 1996 photographs. We estimated the 2012 population size at 33,239 breeding pairs, a 21.8 % decrease from an (adjusted) estimate of 42,528 pairs in 1984. Although substantial, the recent 1984–2012 decline occurred at a much slower rate (λ = 0.991) than the 1942–1984 decline (λ = 0.940). Despite great variation in trends between colonies ostensibly linked to differences in predation rates, the recent decline occurred primarily between 1984 and 1996, and thereafter the overall population grew. A 100-year time series of extended reconstructed sea surface temperatures (ERSST) confirmed that the population declined during warm periods and increased during cool periods, but that the initial decline began before increases in regional ERSST. Population growth after 1996 appears related to the current global warming hiatus, lower ERSST, and increased abundance of a key prey species. We predict a continuation of the long-term population decline after warming resumes. However, unlike many of the true believers and alarmists, they do acknowledge the hiatus in global warming.